Microwaves are funny things. People are terribly superstitious about them, probably because of the word “radiation” or because they act insivibly on food and people find that creepy. I have friends who won’t stand in front of a microwave while it’s running. The urban legends aren’t all false, though: at least two people have been sent to jail for microwaving their babies to death. The popular reputation (“I’ll just nuke some leftovers”) confuses ionizing radiation — the nasty Chernobyl kind that causes mutations — with non-ionizing radiation, a category that includes sunlight, radio waves, and of course microwave radiation. 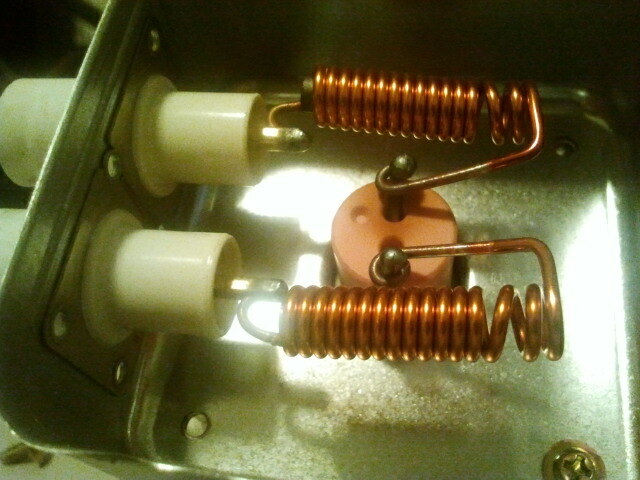 Generally speaking, a leaky microwave won’t cause you to mutate, but it might cook you. Microwave ovens work by surrounding food in an intense, rapidly alternating electromagnetic field. Water molecules in the food are slightly polarized and they try to orient themselves to this field (think iron filings lining up with a magnet); as the field alternates, the water molecules flip back and forth. This motion corresponds to thermal kinetic energy and so the food heats up. Anyway, I’ve never taken a microwave apart before, and besides, I thought it would be funny to make a “Macrowave” — it uses the same principle as the microwave but operates on a slightly larger scale. I started with a Citizen microwave advertised for free on Craigslist (“It works — kind of — but if you want to heat anything bigger than a muffin in less than 5 minutes, use your stove”). A friend had a reciprocating saw that he found in his apartment building’s elevator — no battery, no blades, no (apparent) bloodstains. 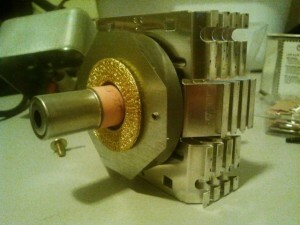 Inside the saw is a fairly hefty 18V DC motor driving a large gear. 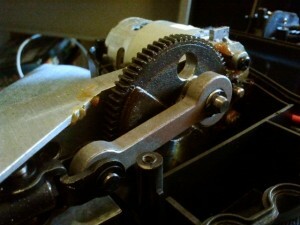 The gear drives a reciprocating shaft down the length of the tool (golly!) to the chuck that holds the blades. 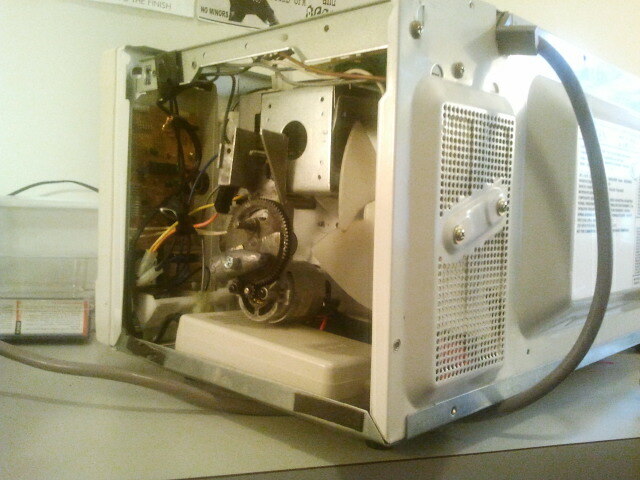 Further stripping the chassis off, we get down to the magnetron tube itself and its heat sink fins. 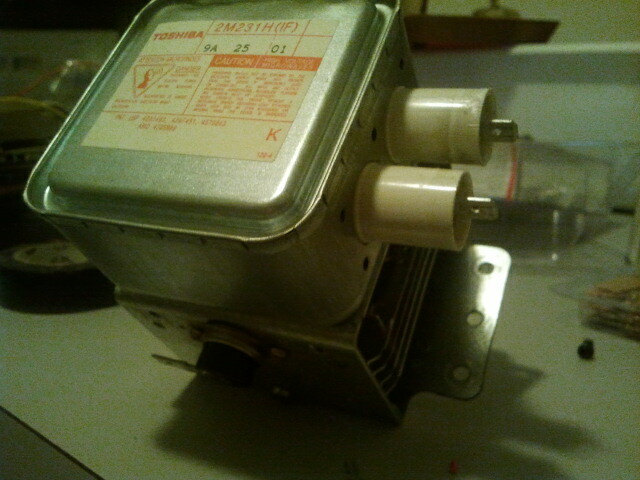 That’s as far as I went with the magnetron tube, not wanting to poison myself. On the reciprocating saw side, the gear takes care of stepping the motor spindle speed (very fast) down to something reasonable (still pretty fast). 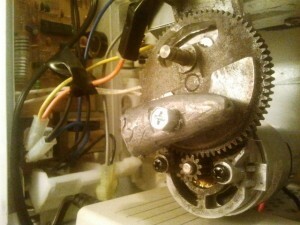 To make it shake like hell, I attached part of a fishing weight to one side of the gear. I cut most of the excess aluminum framing and mechanism off and was left with something that would fit into the spare space left by the magnetron and transformer and that could mount to the old magnetron’s housing. Electrically, the original microwave was really simple: the control circuitry (including the clock, Potato button, etc) switches the high-voltage transformer fully off or fully on using a big relay. For lower power settings it cycles between off and on every few seconds, but when the thing is on, it’s on, no complicated modulation schemes necessary. I pulled the two 120V wires from the high-voltage transformer’s primary windings and used them instead to feed a 17V power supply I had from an old laptop. I fed the output of that through the speed controller from the reciprocating saw — certain speeds shake the thing harder than others, so I fixed it in position and included it. I love this edit of his washing machine/brick video.